There can be a pretty major gap between a heater that is functioning decently and one that is truly functioning at peak performance and efficiency levels. When winter temperatures are at their coldest, it is easy to overlook that your heater is not really firing on all cylinders. You may not want to deal with a heating problem when you need the heater to be running at all times—which is precisely when you really need your heater to be functioning properly in every way! Don’t convince yourself that “good enough” is good enough when it comes to your heater and its overall performance quality. If your heater is failing you in any way, it is time to take the problem seriously. No, it’s never “minor” enough to ignore! A prime example of a problem that too often goes unresolved for too long: short cycling. If your heater is running in short bursts, you may need professional heating repair in Leesburg, VA.
First we said that you should always respond to short cycling ASAP. Then we said that it may require professional repairs. What gives? Well, the symptoms of short cycling are always going to have negative effects—more on those below. However, the actual cause of the problem may not always require professional repairs. If you use a forced air heating system, and that heater is short cycling, then you should always check your air filter before scheduling repairs. If the filter is extremely dirty, it is possible that it is creating enough airflow resistance to cause the system to overheat. The system may actually be shutting itself down to avoid damages caused by overheating. If this is the case, simply changing the air filter may be all that is necessary to resolve the issue. Okay, you’ve ruled out the air filter as the cause of the problem. What now? Now, you call in the pros. If your heater is short cycling and the air filter is clean, then you may have a faulty heat pump run capacitor. 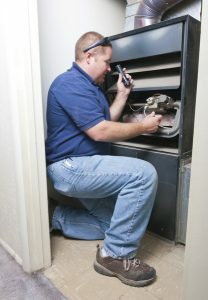 Your furnace’s thermocouple may be shutting the system down because combustion temperatures are unsafe. Maybe your thermostat is malfunctioning. You could even have a heat pump refrigerant leak, which puts your system at serious risk if you continue forcing it to run. Well, okay, something’s wrong—but the heater’s still heating. If your heater is short cycling, the constant starting and stopping of the system is going to put a lot of unnecessary wear and tear on it. That increases the risk of damages. It also drives up operating costs, as it uses more energy to get going than to stay running. Plus, your home just won’t be as comfortable as it should be! If you ask us, paying more for less comfort while also putting your system at risk is not a good deal! Schedule your heating services with Polar Bear Air Conditioning & Heating Inc.